The latest Jeremy Gratham interview, with Charlie Rose. 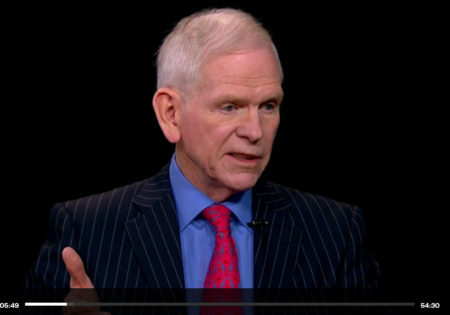 In this 50-min video interview, Jeremy talks about China and world’s energy price; his interesting experience with asset bubbles in the past (a frequent topic, but still refreshing), and his forecast of the US economic growth and stock market. My favorite part is he analogized Fed’s monetary policy as whipping a donkey, trying to make the economy run faster like a race horse. 🙂 Quite accurate. Ray Dalio of Bridgewater Associates updates his outlook on the Europe, the US and emerging markets, and what keeps him up at night. His view that the success of the great deleveraging depends on the right balance between fiscal austerity and debt monetization is interesting and insightful. 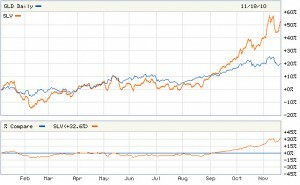 April 2, 2011 / 1 Comment on Are you ready for QE3? Interview of Marc Faber, who thinks QE3 is a matter of time. Jim Rogers gives an update on commodity investing. Watch his comment on Obama’s policy proposal. Muni market is in turmoil. In the following interview, Meredith Whitney gives her update on the muni market and why she thinks municipalities (not states) could default. There should be some opportunities coming up. Investors should keep a close watch on the muni market in coming weeks. To find out why cities got into the trouble in the first place, read this piece on today’s Journal. 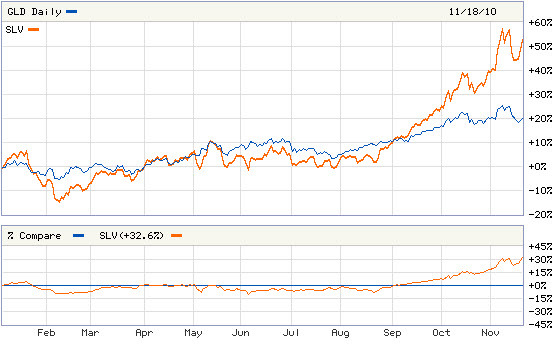 Year to date, silver price has increased by over 50%, and gold by more than 20%. The out-performance of silver relative to gold is a good indicator that gold bubble is entering a new stage, where retail investors poured in and started to grab the alternative to gold , i.e., silver, at a much cheaper price. In essence, silver has become ‘poor man’s gold’. 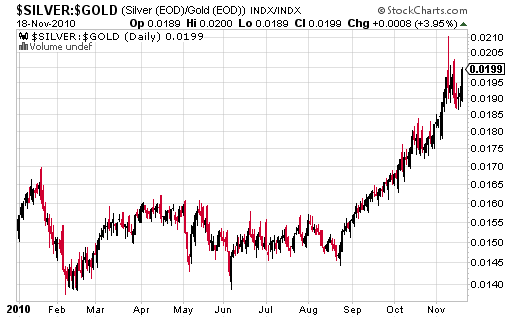 Gold ETF (GLD) is traded around $130, while silver ETF (SLV) is traded around $25. The out-performance of silver started to kick in right around the Fed’s announcement in late August of their intention to ease monetary policy further. To show this, the following chart looks at the relative price between silver future contract and gold future contract, YTD. One year after his first interview with CNBC, Julian Robertson, legend investor and Chairman of hedge fund Tiger Management, came back with his view on the Fed’s QE and fighting on obesity. 1. US equities experience high single-digit percentage total returns after the worst decade since the 1930s. 2. Recessions occur more frequently during this decade than only once a decade as occurred in the last 20 years. 3. Healthcare, information technology and energy alternatives are leading growth areas for the United States. 4. The US dollar continues to become less dominant as the decade progresses. 5. Interest rates move irregularly higher in the developed world. 6. Country self-interest leads to more trade and political conflicts. 7. An aging and declining population gives Europe some of Japan’s problems. 8. World growth is led by emerging market consumers. 9. Emerging markets weighting in global indices rises significantly. 10. China’s economic and political ascent continues. Read more about his predictions here.